“Delta patrocina los eventos culturales de la comunidad latina y queremos ser la primera aerolínea en Latinoamérica”, dijo Héctor Ruiz, Gerente Regional de Ventas de Delta para Latinoamérica. “Por eso apoyamos el arte y servimos comida étnica en nuestros aviones”. 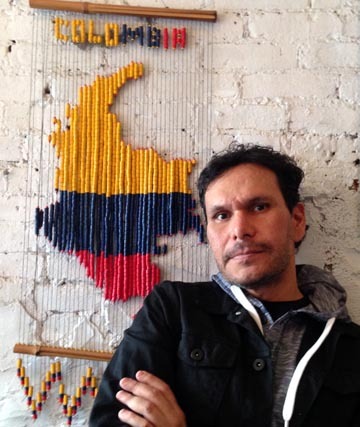 Ruiz habló en el restaurante Bogotá Latin Bistro de Brooklyn en donde se realizó la rueda de prensa del Festival Internacional de Cine Colombiano en Nueva York. Este año es la tercera versión del festival, del 24 al 29 de marzo en Tribeca Cinemas del bajo Manhattan. 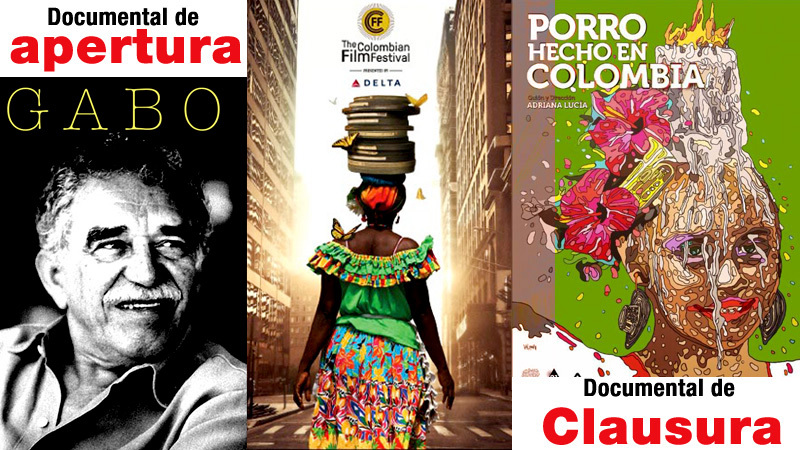 “El objetivo de este festival es traer las películas colombianas a grandes escenarios Nueva York e impulsar la cultura de nuestra tierra”, dijo Juan Carvajal, fundador y director del 2015 Colombian International Film Festival in New York City (nombre oficial). “Por eso le agradecemos a nuestros amigos y patrocinadores”. Carvajal dijo que los festivales son el último y más importante eslabón de los cineasta. En este festival hay cuatro estrenos mundiales y películas “bien realizadas” como Santuario, Corazón de León y Tres Escapularios, entre otras. De este festival nació el Festival ‘Indiebo’ de Bogotá, con películas independientes y que también cuenta con el patrocinio de Delta. Juan Carvajal, fundador y director del Colombian International Film Festival in New York City. Este festival va a exhibir ficción, documentales y cortos. Esta es la programación general. Algunas de las películas se presentarán gratis. How did a boy from a backward town on the Caribbean coast become a writer who won the hearts of millions, from the poorest to the most powerful political leaders, and whose works changed our perception of reality? The answer is the incredible story of Gabriel García Márquez. Rosana and Hermelinda, two illiterate peasants receive Pastor’s letter from whom they have not had news for months. Anxious to know about the young husband’s luck, Hermelinda and Pastor’s mother begin a trip toward to the nearest village in search of somebody that reads the letter. Two lives cross in the days preceding the takeover of the Palace of Justice. The journalist Arturo Mendoza, rised on a traditional family with important connections in social and political groups of the time, and Milena Bedoya, daughter of one of the employees of the Palace, discover that behind the death of a journalist there’s an entire conspiracy on a possible takeover of the Palace of Justice. Nieve, an eight year old cuban girl, is the object of her parent’s custody battle. Her mother, Eva, is an artist who believes in the revolution without censorship or authoritarianism. She is remarried to Dan, a swede working on the construction of a nuclear plant. Manuel is Nieve’s father, a playwright who sacrifices his art to write government propaganda in a remote area of the country. A young couple, Sarah (Julia Stiles) and Paul (Scott Speedman), travel to a remote Colombian town to take over a paper mill owned by Sarah¹s father (Stephen Rea). What starts out as a promising new life in the lush tropics soon turns into their biggest nightmare as they encounter terrifying glimpses of a dark evil. An addict fighting to conquer his demons, Jose escapes from the streets of Bogota and build a new life with his family in Spain. But when the global economic crisis threatens to take everything away again, he must call on his survivor’s spirit to prevail. Marcos, a young aspiring journalist, wants to know if Colombia is a heavy-drinking country. Together with a friend, he decides to make a documentary in Las Delicias neighborhood, located on the south of Bogotá. Once a “fugly” ghetto nerd, living in the footsteps of his handsome older brother, Jesse Sanchez’s life course takes a turn in the right direction after catching a break following a hit stand-up performance at a local comedy night. Making his way to the big screen, Jesse is now rolling in the big bucks as a C-list actor – the king of exploitative Latino characters. Tres Escapularios is a movie about the act of committing murder. Two assassins, Nicolas and Lorena have to carry out the assassination of a Colombian guerrilla ex militant who’s testimony to the authorities provoked the bombing of a guerrilla camp where many combatants died. After living nearly his entire life in New York City with false documents,burgeoning Finance professional Camilo Sanz receives a notice of deportation. Desperate for a solution at any cost, he obtains funding from a nefarious neighborhood loan shark, and dives head first into a fraudulent marriage with a relative stranger named Hailey. For young men in Buenaventura, Colombia – a dangerous area policed by paramilitaries and poisoned by the drug trade – the prospect of a better life requires getting out of Buenaventura. And getting out means getting your hands dirty. Such is the case for Jacobo and Delio, estranged brothers who agree to transport millions of dollars’ worth of cocaine up the coast and into Panama for a quick payday. During the years between 1983 and 1986, the French Basque Country and Bayonne are the backdrop for a series of attacks directed by GAL members and suspected members of ETA. Behind the settling of accounts held by the Spanish police in complicity with the French, the end of ETA’s “sanctuary” in France is at stake. Alicia, a sick child who dreams with the dress of her favorite Japanese series Magical Girl Yukiko. Luis, her father, will try to do everything in his hand to achieve it. But his fate intersects with Barbara, an attractive young woman with mental disorders and with Damian, a teacher retired from everything but from his troubled past. Juana is a divorced lawyer and business partner of her former husband Edgar in a law firm. One day, after losing her phone she receives a call from the charming León who found the phone and intends to return it. In the telephone conversation great empathy is established and both feel an immediate interest, therefore they set up a meeting the next day. The problem is, León’s height is only 1.36 meters. Black comedy set in the urban jungle of Bogota, where everyone has to be held accountable for their own survival, in a chain of disloyalty and betrayals that in more than one case will end with death. Former police sergeant, Diogenes Hernandez, owns “The Universal” a precarious private detective agency headquartered in the apartment where he and his wife Fabiola live. Buenaventura, don´t leave me is a documentary about the Colombian artist Yuri Buenaventura who, thanks to his voice, managed to become one of the most influential Latin artists in Europe. Recorded in the two epicenters of his music, Buenaventura and Paris, the film portrait the steps that led him to become the prince of Salsa. Manuela appears to have every advantage, but her perfect smile is as superficial as the lifestyle for which she is being groomed. She is an only child of wealthy parents; she has a loving boyfriend, and a best friend to confide in. Despite appearances, Manuela is deeply unhappy. A secret love for her best friend boils inside of her and as the film progresses we see cracks in the façade of her perfect life. Ten year-old Eric finds himself almost overnight living with Gabriel, his father, who he barely knows. The man has trouble keeping their heads above water and building a relationship with his son. Maria Isabel, the woman Gabriel works for as a carpenter, decides to help and invites them both to the country to spend Christmas with her and her family. The colombian Dream tells the story of twins, two youngsters who are vacationing at a thermal baths spa nearby Bogota, both in their eagerness to get easy money start selling hallucinogenic drugs among customers of “El colombian dream”, a bar of their family . One of its suppliers gives them a huge amount of “goods” which he has stolen from his partners, but dies from an overdose. MONTE ADENTRO explores the universe of one of the last muleteer families in Colombia and follows the mule train and lives of two brothers, “the Gypsies”. Alonso, one of them, now forced by the illness of their mother to live in a city, attempts to start a new life while accompanying his mother who the doctors won’t allow to return to live in the mountains.